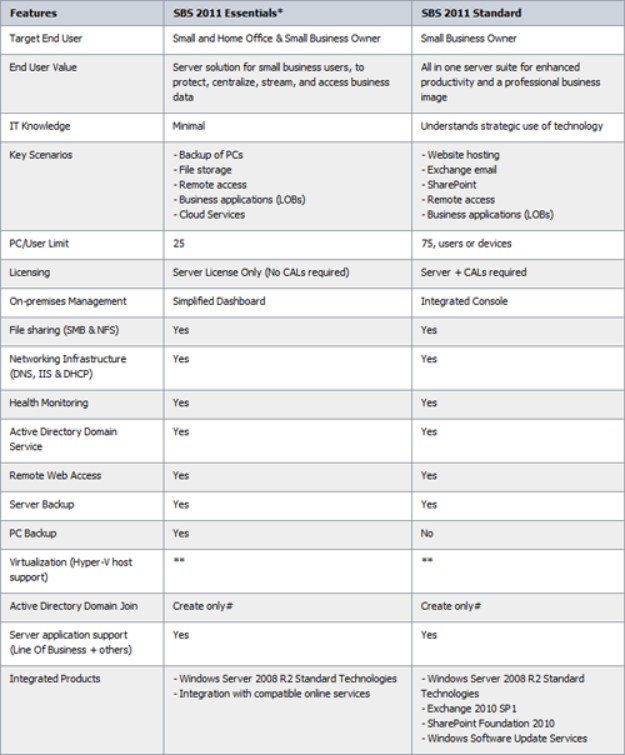 As you are probably aware Windows Small Business Server (SBS) 2011 Essentials is very similar to WHS 2011 in some respects but do you know the differences between SBS 2011 Essentials and the standard version of SBS 2011? If not then we have the following chart available for you which should give you some of the answers. * Hyper-V role is not available for SBS 2011 Standard or Essentials, however is supported through the Small Business Server 2011 Premium Add-on. (1) SBS 2011 must own the Active Directory FSMO roles, additional Domain Controllers and member servers are supported.